This week, we are happy to introduce a new infusion, white pepper. Originating from India, and prized for its ability to enhance the flavor of food, pepper has been traded for millennia and has become an integral part of many cuisines. The pepper plant produces three different types of pepper. Black, the type most people are familiar with, are when the whole ripe fruits are allowed to dry with the outer cover still intact. Green peppercorns, common in Southeast Asian cuisines, are fruit that are picked before they are ripe, and are often dried or pickled. 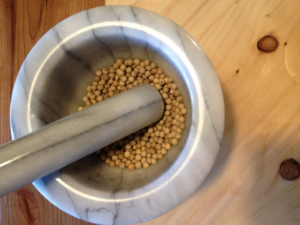 White peppercorns are when the black peppercorns have their outer covering removed before or after drying. White pepper has the classic distinct peppery bite, but is a bit milder and not as broad of a flavor as black pepper. Saisons often have a peppery bite, and this seemed like a natural pairing. To get the best effect, we ground the peppercorns just prior to adding them to the infusion. We will also have two dry hopped saisons to offer this weekend. The first is hopped with Warrior. Warrior is a hop known for its bittering properties, but is sometimes used in late hop additions. Warrior has a pronounced resiny taste and aroma. The second dry hopped saison is hopped with Perle. This German hop expresses a woody and spicy character often found in continental hops. Of course, Eddy, Burnside and Blaze will also be available. We hope you enjoy, and look forward to seeing you in the tasting room.